"'Take note of this bonnet, Ariana,' Mrs. Bentley said. Ariana obediently surveyed the page open before her and exclaimed, 'How lovely!' It was a novel and elegant little piece of headwear, trimmed in Brussels lace and ribbon and sporting a dashing little ostrich feather. Forgetting her qualms she noted boldly, 'None of my bonnets has a real feather!'" One of the challenges historical authors face, depending on the story line, is where to take their heroine shopping. In Before the Season Ends, Ariana Forsythe is faced with being outfitted by her wealthy aunt for a fashionable London season at the height of the Regency--any girl's dream, right? Not for Ariana! Since her Aunt Bentley is fashionable herself, however, she insists upon dragging the young woman along for a foray into London's elite shops for the best of the best. One such place sure to be on any fashionable lady's agenda was "Harding, Howell and Co.'s Grand Fashionable Magazine" at 89 Pall-Mall. Quite a mouthful, that. But it tells its patrons with no apologies that it is the place for fashion, since the word is in its name. When Mrs. Bennet in Pride and Prejudice laments that she must be on hand to show Lydia where all the best warehouses are in London, no doubt she had this place in mind. Ornamental articles in ormolu, French clocks, etc. Perfumery and everything necessary "for the toilette"
As you can see if you look at the above illustration, HH&C had a large circular "solar" window. It was the sort of place that didn't look so very large from outside, but once indoors, you could go on and on and deeper and deeper into a seemingly endless variety of rooms and recesses. As a teen and young adult, if I went into NYC with a friend, we could easily spend the whole day shopping at Macy's (yes, the same one from "Miracle on 34th Street"). We'd avail ourselves of the elevator instead of the escalator whenever we could, and elbowing through the crowd, shop til we were ready to drop, literally. Then we had to face the subway or Long Island Railroad to get back home. (What amazes me is that I thought such outings were fun.) 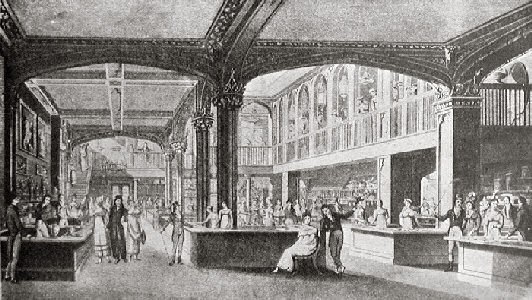 Anyway, a trip to HH&C could easily occupy a regency lady's whole morning, which is when most shopping was done. For jewellery, despite the offerings at HH&C and other places, the destination for the fashionable elite was Rundell's. (Rundell, Bridge and Rundell, technically goldsmiths.) 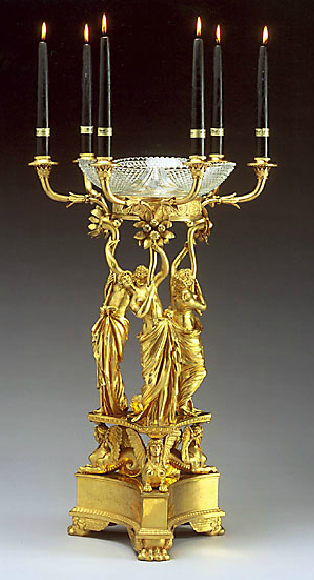 Even the Crown commissioned Rundell's when it wanted new pieces, and not only for jewels, but other pieces in gold, silver, bronze and gilt, such as the fabulous centerpiece, below. 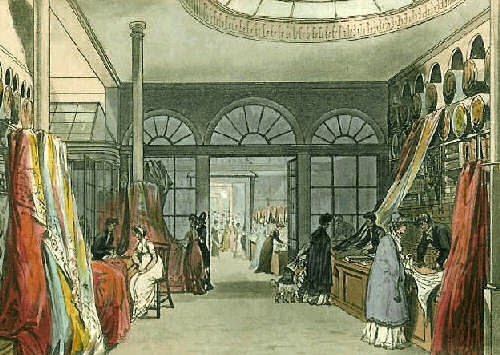 Did you enjoy this short peek into regency shopping? Do you have a favorite resource book the rest of us might find illuminating? Please share! Amazing the pomp and circumstance that went in to just getting ready to go shopping in Regency England, not to mention the gobs of money spent while on the outing. Speaking of which, even though this doesn't really compare, my grandmother wouldn't even walk to the mailbox in the 1940s without getting "dressed" for the occasion, even going so far as to wear her pillbox hat! Me? As long as I fairly presentable, I'm good. Great tidbit, thanks, Pam. Society seems more relaxed today, for sure, when it comes to being presentable, doesn't it? 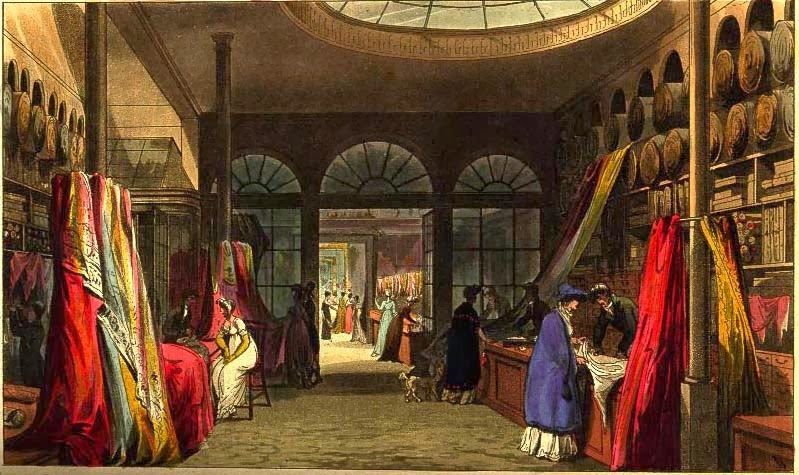 How fun to learn a bit about shopping in Regency England! What a task!! I must say, that type of shopping experience doesn't appeal to me. Thank you for sharing. Wow! Shopping in Regency England was really something. Thank you for sharing your most interesting post. My pleasure, Melanie. Thanks, all of you for coming by!